Brrrrr! It’s cold outside today. It’s also snowing like crazy and they are calling for sleet and freezing rain so it’s a good day to stay inside. I’ve got my sweats on and I’m trying to stay warm. Since I can’t go out and it’s almost Christmas, I wanted to do some holiday baking. I’ve already made chocolate chip cookies, oatmeal cranberry cookies, and sugar cookies, so I wanted to make something a little different. 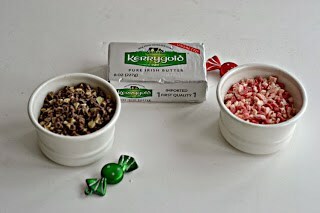 The lovely people at Kerrygold sent me a few pounds of butter to make some holiday treats with so I took advantage of that! 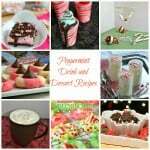 They are hosting a Holiday Recipe Contest and I can’t wait to share my holiday treat. I love to use Kerrygold Unsalted Butter in my baking because it has a higher butterfat content that makes cookies buttery and delicious and pie crusts flaky and perfect. 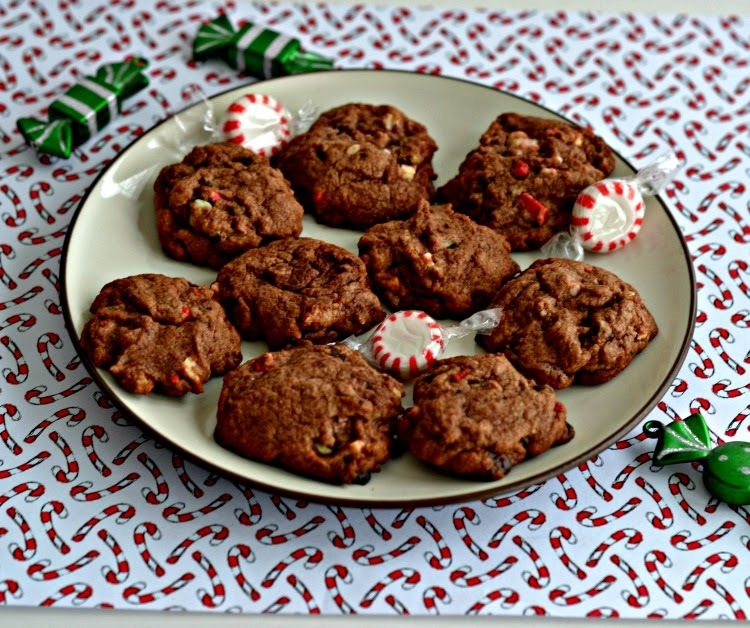 When I think of the holidays I often think of peppermint and chocolate so I wanted to showcase those in a cookie. 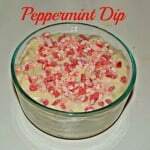 I had red peppermint crunch chips and green chocolate mint chips in my pantry so I worked those in as well. 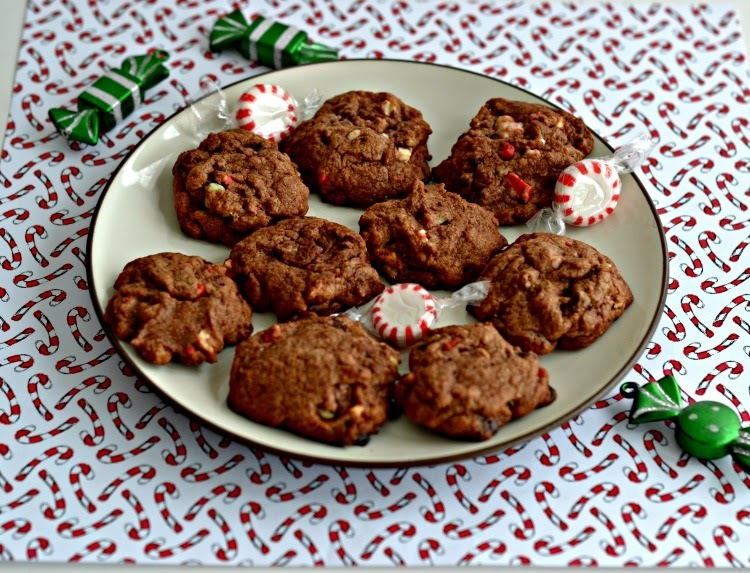 I then made a buttery chocolate cookie, added in the chips, and baked the cookies. They came out crisp on the outside and soft on the inside. The cookies were rich and buttery with a lot of chocolate and peppermint flavor. 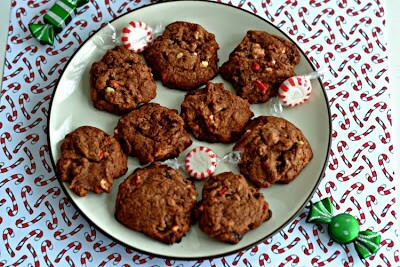 The red and green chips added a festive touch to the cookies as well. 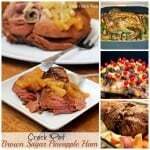 I’ve already got another batch frozen in the freezer waiting to bake on Christmas Eve! 2. In a medium bowl combine the flour, baking soda, baking powder, and salt. Mix well and set aside. 3. In a large bowl cream together the butter, sugar, and brown sugar until smooth. Add in the eggs one at a time and mix well. 4. 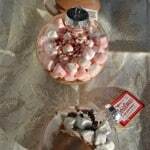 Stir in the peppermint and vanilla extract. Add the cocoa powder and mix until completely combined. 5. Add the flour mixture to the butter mixture and stir until combine. Fold in the chocolate mint chips and the peppermint crunch chips. 6. Drop tablespoons of dough onto a cookie sheet. Bake for 9-10 minutes or until cooked through. 7. Remove from oven and cool for 1 minute on the baking sheet. Remove to a wire rack and cool completely.